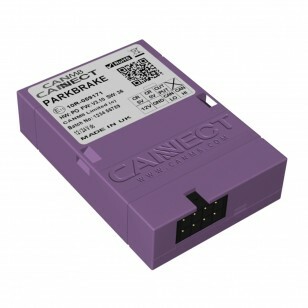 The CANM8 CANNECT PARKBRAKE is a CAN Bus interface specially designed for vehicles which feature CAN Bus wiring and is especially useful for applications where the vehicle is fitted with an electronic park brake. Park Brake > 12v (1A max) when the park brake is engaged. The CANM8 CANNECT PARKBRAKE is ideal for use when installing any after-market electronic products that require an input of the status of whether the park brake is engaged or not. PURPLE > Park Brake Output : 12v (1A max) when the park brake is engaged.